In December 2016, [Bruno M.] was lucky enough to score a 70+ year old Logan 825 lathe for free from Craigslist. But as you might expect for a piece of machinery older than 95% of the people reading this page, it wasn’t in the best of condition. He’s made plenty of progress so far, and recently started tackling some broken gears in the machine’s transmission. There’s only one problem: the broken gears have a retail price of about $80 USD each. Ouch. On his blog, [Bruno] documents his attempts at replacing these expensive gears with 3D printed versions, which so far looks very promising. He notes that usually 3D printed gears wouldn’t survive in this sort of application, but the gears in question are actually in a relatively low-stress portion of the transmission. He does mention that he’s still considering repairing the broken gears by filling the gaps left by the missing teeth and filing new ones in, but the 3D printed gears should at least buy him some time. As it turns out, there’s a plugin available for Fusion 360 that helpfully does all the work of creating gears for you. 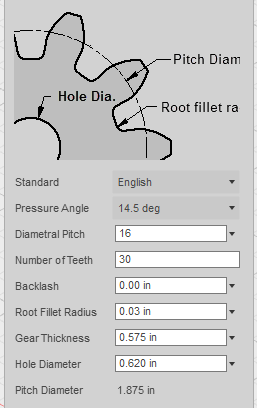 You just need to enter in basic details like the number of teeth, diametral pitch, pressure angle, thickness, etc. He loaded up the generated STL in Cura, and ran off a test gear on his delta printer. Of course, it didn’t work. Desktop 3D printing is still a finicky endeavour, and [Bruno] found with a pair of digital calipers that the printed gear was about 10% larger than the desired dimensions. It would have been interesting to find out if the issue was something in the printer (such as over-extrusion) or in the Fusion 360 plugin. In any event, a quick tweak to the slicer scale factor was all it took to get a workable gear printed on the third try. This isn’t the first time we’ve seen 3D printed gears stand in for more suitable replacement parts, nor the first time we’ve seen them in situations that would appear beyond their capability. As 3D printer hardware and software improves, it seems fewer and fewer of the old caveats apply. Wow! That’s cool. I also find a slight increase in dimensions if I make the tolerances exact, especially on that first layer. In my case it’s very likely over extrusion, as you said. If the gears are in such a low stress place, why did the teeth break in the first place? Guessing maybe a jam occurred or something and it sheared off the teeth where it was at the moment? Someone took too big of a cut. why stop there? seems like the logical next step would be do make silicon molds of the printed parts and make them out of resin or even better use them to cast real metal parts…. I’ve 3D printed gears for crank open vent window gearboxes on some old cars. That was after I made a mold to cast some in resin. 100% infill PLA 3D printed turned out to be far stronger for the application than cast urethane or even a supposedly super high strength, aluminum filled epoxy that has to be heat cured in an oven. On the cast gears the teeth on the worm wheel would easily snap off when the gear hit the stops, despite the crank handle being only about 1.5″ long. With the PLA I can really put some torque on and they’re fine. Nylon should be even stronger but I haven’t tried printing with that yet. Maybe the PLA has a bit of give in it? So it bends instead of breaking. Nylon can be wayyyy more durable if you anneal it in boiling water for a few minutes, too. Old trick from my model airplane days (with nylon propellors). If he has a lathe, he can broach metal (or plastic) gears…it’s just really slow, especially if there’s a lot of teeth. My girlfriend does not have many teeth..
Tig or maybe even mig or arc weld “real” ferrous metal back onto the gears and not just braze. Then maybe you can do like the above video or use another indexing head type mill setup or other way (technically you can even use a jig hacksaw/file. Way to go! I have a HP8460b that I’m going to super glue the gears that are cracked for now and maybe later invest in the brass versions. Did he check to see if there is a brass equivalent that is cheaper than steel? Helical might even be more accurate and less drag. OK… too many thoughts. Perhaps until he replaces the gears, he hasn’t got a lathe. You can’t machine parts for a machine on a machine that needs new parts. Still yep it’s a good idea, if he can get by with the plastic ones to bootstrap it up into cutting real metal ones. Seems kind of a waste to do otherwise. Wonder how much effort to turn the Logan into CNC? I inherited a harbor freight little lathe and a lot larger wood lathe and some other tools Dad made (hydraulic press, brake, farm tools, etc.) that I am trying to organize what’s left that he didn’t scrap out to sell in his later years at shows. Seems strange where the wood lathe he made is so heavy duty and when I was younger he swore to only use for wood if I ever put together though was designed for using metal lathe chucks. Probably more a safety age related concern since in my teens or earlier era. Interesting though later in life when he bought the cheap harbor freight lathe (I wonder if someone gay bombed him when I left for Tech cause he started buying cheap tools too (like he’d pick on me using Mitutoyo and the only foreign stuff he owned were gifts like china (RS Prussia) or a german binocular he got on a Goodwill Ambassador mission), was eating out, bought a Kia spectrum and acting like I never remember him acting) he seemed to agree in regards to components that we’d have to replace to increase the tolerances and make into CNC if I really wanted to… though I do see hunting around for a larger metal lathe to restore does afford the parts already machined that are easier to restore. Like I learned in high school in machine tool classes… unless you are really artistically careful with you measurements and hand work… most need more accurate tools to make a tool that is equal to in accuracy. Granted… that’s not always the case. Hmm…I wonder if the price quoted is from Logan. When rebuilt my Logan they were available from Logan Actuator Co. The grandson of the founder tried to keep all the parts available. I don’t remember them being that pricey. That price was from Logan. Its actually 83$ per gear. There is a zamak (i think) gear in the Atlas 7* series of mini metal shapers of about that era that lets go, that has become unobtanium because it is helical (IIRC). I wonder if this technology would make for a durable enough sacrificial gear for that as well. There is a sacrificial gear made out of zamak (pot metal) in the old Atlas 7b shaper that is unobtanium and hard to make because it is a helical gear. I wonder if this technology would produce a hardy enough replacement. If it’s a static display, it will work, but it’ll never run and do actual work. The backpressure will strip those plastic gears in seconds to minutes. (since you provide no evidence to back up your opinion, neither will I. But if you search for ‘mrpete222 3D printed gears’ you will sure find another example of this application) Try to be less grumpy when reacting on the internets, it makes life more fun. bearing material that is also probably more accurate as well and doesn’t need to be remade. Nice to see actual 3D gear generation being made easier as well. The original metal gears failed but here put these plastic 3d printed gears on and you’ll be good as new. More 3d printer hype! Your not gonna do much with those gears in place. My brother broke a transmission gear in a riding lawn mower once. I took apart the transmission and pulled out the gear. The dealer wanted $350 for a new one. My dad is a machinist. He took the gear, drilled two undersized holes where the broken tooth was, pressed in two hardened pins into the holes, brazed around the pins for filler, and then recut the tooth. It works great even after 20 years. Could you design the same gear in Fusion and use it to cut a hole in another object to make a mold? Seems like you could then pop the original gear in and recreate the missing teeth using JB Weld, especially so if you could rough up or otherwise give it something to bond to. The gears being made are probably part of the train that drives the leadscrew. Without the gears he has no power feed nor threadcutting capability, but the lathe can still be used to turn objects. The mechanical advantage provided by the leadscrew means that these gears aren’t under nearly the kind of stress you’d have in a transmission or similar; on a small lathe that has a crank on the leadscrew, the crank can be turned with two fingers. As long as he doesn’t use heavy feeds the gears may work a treat. Time will tell. I go back to my first post. If the gears are in a place that puts no stress on them, than why did the metal parts have teeth shear off of them? For all the grumpy old men that think 3D printing is too weak for this application: no, it is not, surprisingly! Original gears likely stripped because someone tried to reverse the lead screw without first stopping the lathe. Another application for 3D-printed gears would be the 32-tooth gear for the thread dial on a lathe. Another way to strip the reverse idler gears is to run the carriage under power feed against a stop. Plastic change gears have and continue to be used in the Logan 10″ gear train. See Conrad Hoffman’s site and his use of plastic metric transposing gears. The gears pictured are the tumbler gears also in the gear train. They are typically broken when users engage the “back gears” while the chuck is in motion or when trying to remove a stuck chuck with a huge lever arm while engaging the same back gears. If not abused, I would definitely try a plastic printed gear.